When planning a trip to Blackpool, visitors may want to consider some of the year's many fantastic events, including the famous Blackpool Illuminations, which light up the length of this Seaside resort. A range of events are happening this year in what is known as the Las Vegas of the UK! Take a look at some of the upcoming events in Blackpool this 2018. 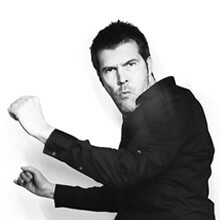 Welsh comedian, Rhod Gilbert, returns to comedy after six years and discusses the unfortunate turns his life has taken since the last time he was on stage.